The film progresses like a prequel to 1984. Paris is under siege, and the fascist occupation is spreading rapidly. It happens so fast that the disaffected protagonist, Georg (Franz Rogowski), doesn’t know what areas of Europe are occupied and which are not. Beyond seeing riot police invading streets and apartment complexes demanding for papers, the occupation is an unseen force. It is ultimately unimportant whether the opposing forces occupy Eurasia or Eastasia, as fascism as a force is the only tangible enemy. Georg is first seen talking emigration, which is an increasingly difficult task, with a journalist (Sebastian Hulk), who gives Georg an opportunity to get out of France before the occupation inevitably gets worse. Georg doesn’t show an intense desire to leave, but, once given the opportunity, he jumps on it. His means of escape is through a dead man, a writer named Wiedel. With his passport and his final manuscript, Georg assumes his identity in order to secure passage to Mexico. But, even with the documents, his path to transit is not an easy one. Along the way, he floats into other peoples’ lives and tries, in his disaffected way, to help them find happiness. Like Petzold’s last film, Phoenix, assuming another’s identity is at the center of the narrative premise. But the world of Transit has a much larger scope than Phoenix. While the central narrative may revolve around one man and his interactions with a handful of people, the world existing on the edges of the frame is filled with strife. At times, military police in riot gear march through streets and shakedown civilians. At others, the corners of the frame are creased with images of romance, as if to spit in the faces of the characters we are following, whose attempts at connection are fraught and strained, and to bring to the novelization of the film itself added flares of fantastical hope. And fantasy is the operative world, because as the world surrounding the characters is slinking into the black hole of oppression, the voiceover narration telling, in retrospect, Georg’s story is laced with fiction within fiction. The narration fictionalizes the drama of these characters, as we see on screen what is ostensibly the truth. First, the narration paints tiny inaccuracies, but these misremembered of purposefully enhanced scenes, marked by their elegant and prosaic diction, balloon until the final scenes of this protagonist’s plight feel as though they are being told as pure fantasy. But we know the beauty of the prosaic narration cannot be true. Melancholic, we see the cracks in the storytelling, which leave the final moment of the film not one of fantastical hopefulness, but one of unadulterated tragedy. While this juxtaposition of fantasy and bitter realism is fascinating and drives this narrative forward, there are moments of stagnation in the film that are hard to digest. Part of this correlates with the plainness of the protagonist, who acts as an empty slate until the narrative requires him to possess intense emotions; neither aspect of his character function effectively. The flights of fancy narration elevate his tale beyond his flatness. But, in the strangest way, the film overstays its welcome in the final act. As much as the pacing gets hampered by this, it is done with intentionality. The characters begin to repeatedly backtrack. It is a roundabout motion that, however tedious it feels in the end, is in service of the revolving door nature of this fascistic world. And that the characters allow their increasingly blind passions to drive their circular actions simply feeds into this idea of fraught hope in a time of hope in absentia. There is something comic in how the characters continually find themselves in the same places, but in truth the return to point A signifies that the characters were doomed from the start; they started the film being already too late. So for each scene that makes the film feel redundant, there is a scene following it that puts the redundancy into relief. Petzold structures the film so one cannot work without the other. For a viewer, this can produce a fatigue that sullies the final 30 minutes, but that fatigue is undoubtedly an intentional byproduct. 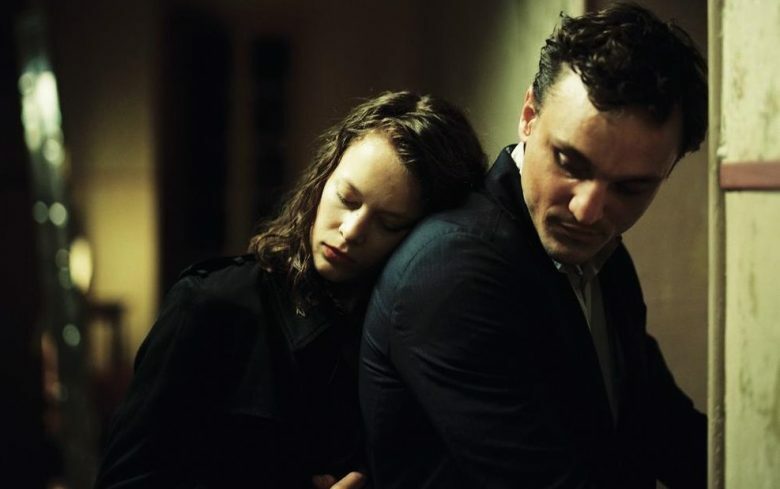 Petzold, it seems, is aiming to wear us down, to show us beauty and hope and fragile intimacy, then tear that away from us slowly and painfully. In this light, Transit is intensely effective. It takes comedic and heartfelt relationships and twists them, perverts them in the mire of oppression, until they come out the other side colored only by strife. What is left to hold on to, after this, is the narration. A falsehood. We cling to fiction as if it will save us, but our knowledge of its fiction breeds a bitter irony, and the tragedy remains inescapable.